It is probably safe to say nearly everyone has experience tooth problems at some point in their lives. Be it a chronic, mild, dull, sharp, intense or severe tooth pain it can radiates from a tooth, several teeth or the jaw itself. Most often toothaches are caused by a dental problem such as a cavity, a cracked tooth, a decayed tooth or an exposed tooth root. Other tooth pain can stem from gum disease, a disease of the jaw joint or spasms of the chewing muscles. Severe tooth pain can be activated by chewing, by exposure to hot or cold, by air, or by sweets at any moment in time. It can last three days and then disappear altogether. It can be accompanied by swelling, by a show of blood or a bad taste. In addition, it may even be caused by something other than the teeth or anything to do with the mouth at all. Severe tooth pain can be transferred pain actually originating in another part of the body. Pain around the lower teeth and jaw could be warning signs of angina or a heart attack. Pain around the back teeth (upper and lower) and jaw could indicate ear infection (inner or even external). Pain in the upper teeth (front or back) often accompanies a blockage in the sinus airways or infection in the sinus cavity (sinusitis). On rare occasions, chronic toothaches can be caused by an undetected condition of the nerves. For the most part, people know when it is their teeth but because mouth, jaw and severe tooth pain can be a sign of a number of dental or other problems, it is best to seek a professionals help. Most often, this simply means a trip to the dentist, although it is sometimes necessary to see a medical doctor as well. A thorough examination, some X-rays along with a consultation can determine the cause all in a single visit. Many dental conditions such as caries (cavities), tissue neoplasm, abscesses, demineralization and jaw joint disorder are all guilty of causing severe tooth pain. 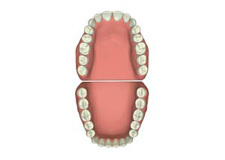 A decaying tooth which does or does not have an inflamed pulp (can lead to abscess) as well as a cracked, split or fractured tooth can all lead to inflammation of the tissues around the tooth and subsequent pain-often constant and/or severe with pressure as well as sensitivity to the touch. Severe tooth pain when biting down on food can be caused by such things as a loose filling, tooth decay, a cracked or split tooth, a tooth that needs endodontic (treatment of dental pulp disease) treatment, a root canal which is not responding well, cuspal (ridge on cap of molar) and/or vertical fractures of the tooth. A dull ache near a tooth and/or severe tooth pain when biting down on food can be caused by periodontal disease (involving tissue that surrounds the base of a tooth), receding gums, wisdom teeth moving or breaking through gums or an impacted tooth while chronic pain of neck, ear or mouth accompanies teeth grinding (bruxism). In order to guard your teeth and avoid any severe tooth pain eat a diet rich in whole grains, fruits and vegetables to ensure the proper nutrients needed for good tooth health. Whole foods (as close to natural state as possible) are a natural tooth cleanser, scrubber and stain guard while sugars, white refined flours, sodas and processed foods actually mix and allow sticky masses to remain on teeth becoming perfect targets for bacteria growth. It does not take long for these bacteria in and around the teeth to breaks sugar down into acids. Acids, when combined with enamel calcium causes erosion and decay.